Simulated racing is by far the fastest-growing segment of the motorsports world. For less than the price of a single test day at a racetrack, anyone can purchase a complete setup for their home and start practicing. Through service companies like iRacing, drivers can enter multi-player races and compete against others, win money, and gain fame in the sim racing world. Companies like iRacing and others are making their simulations as realistic as possible by micro-scanning the racetracks, and by perfecting the physics and performance of every car in the game’s garage. 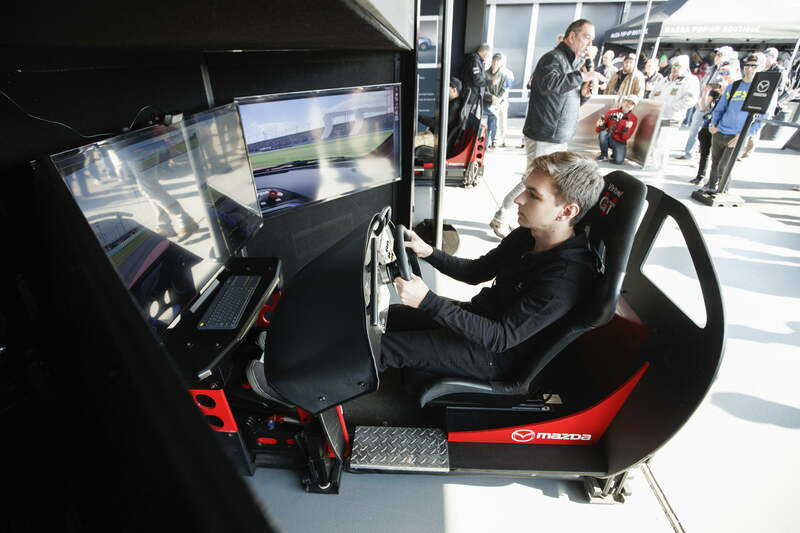 To test the theory that a sim-racer could really perform in a real race car, Mazda Motorsports and iRacing decided to seek out some gamer talent and give them a shot in a real race car. 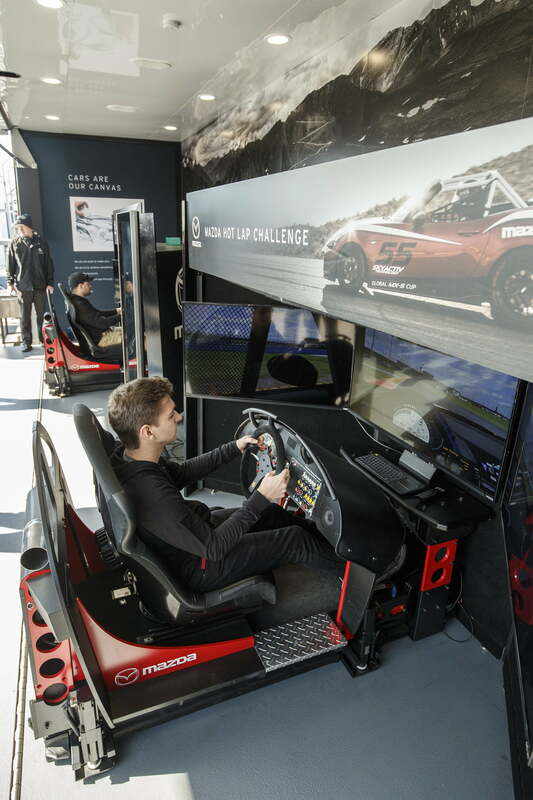 To find the best simulated racing drivers in the country, the Mazda Hot Lap Challenge tests a driver’s ability to set the best lap time around the same road courses used by IMSA racers. Anyone with iRacing on their home gaming system can participate in any of seven scheduled Time Attack competitions set on seven different tracks, or you can lay down your best lap on a full-scale simulator Mazda brings to the same seven tracks at IMSA events throughout the year. For 2018, the qualifying tracks were Daytona, Lime Rock, Watkins Glen, Road America, Gateway, Laguna Seca, and Road Atlanta. Two winners are selected from the qualifying events; the best of those playing at home and the best among the at-track competitors. Both finalists receive a trip to the Rolex 24 Hours of Daytona for the final shootout. Side by side, the two drivers compete on identical simulators driving identical simulated Mazda Miatas to see who can turn the fastest lap of Daytona’s challenging road course. The first of the 2018 finalists was Charles Mayer from Granby, Connecticut. 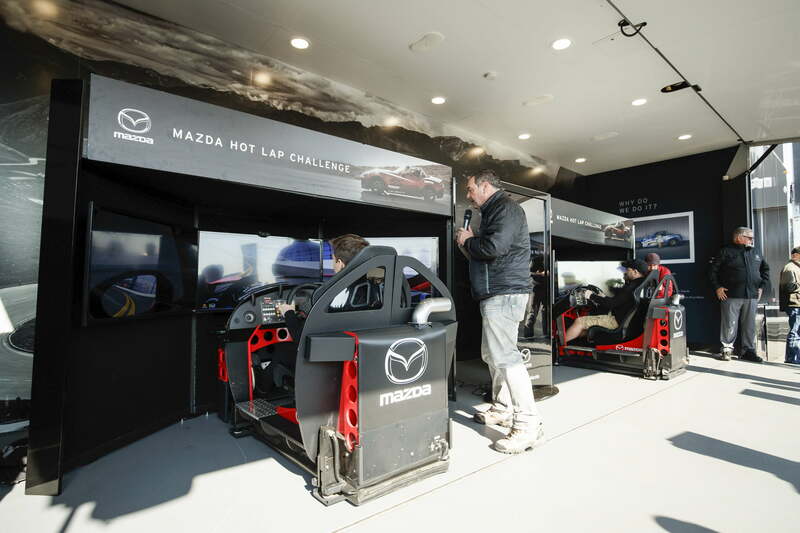 Mayer put down a fast lap on Mazda’s simulator at his home track, Lime Rock Park. “I drive in track days in my Porsche 944, and the braking distance, the pressure, everything is very different in the simulator,” Mayer told Digital Trends. The second finalist was Logan Clampitt of Orange County, California. Clampitt qualified from his home system, where he is a leading iRacing competitor. Clampitt looked at the Hot Lap Challenge and decided to make this competition part of his program. If you’ve already guessed that Clampitt won the shootout, you’re right. 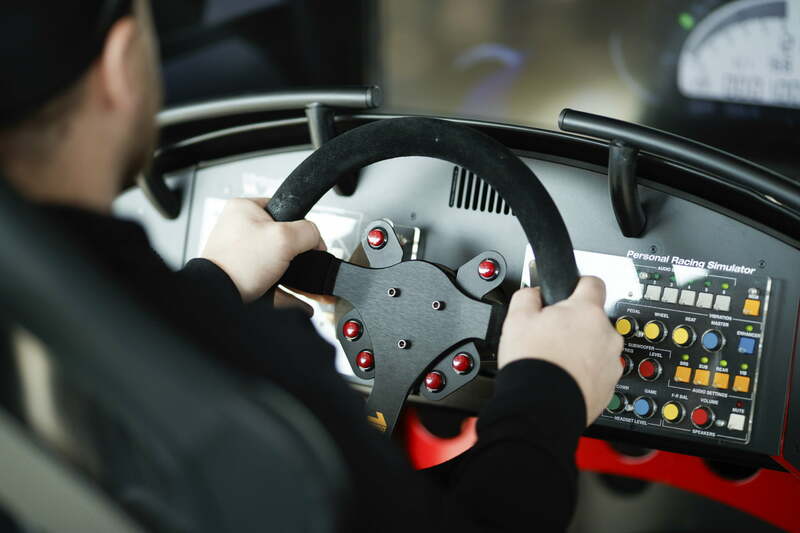 Each driver was given 15 minutes on each of the two simulators to lay down their best lap. At the end of the half-hour shootout, Clampitt’s best time of 2:14.827 was about five seconds faster than Mayer’s best time. The victory earns Clampitt a test day at Virginia International Raceway in a fully-equipped Global MX-5 Cup car. Mayer took his second-place finish philosophically. “It was an awesome experience,” he declared. “I’m glad I had the opportunity to come out here and do this, and I want to thank Mazda for getting me down here,” he said. The Mazda Hot Lap Challenge will be on again for 2019, and drivers can sign up at iRacing.com. 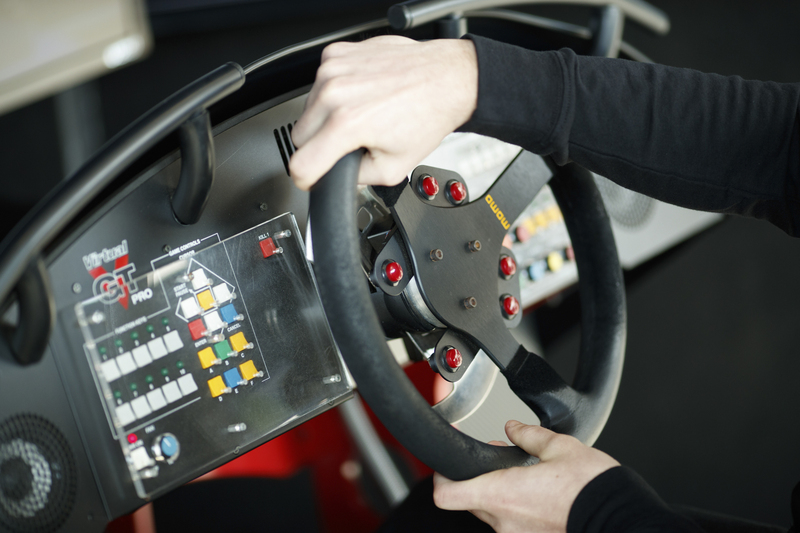 It’s exciting to see enthusiasts learning to race on a gaming system and potentially making the jump to an actual race car, but established professional race drivers also rely on simulators to make sure that they’re ready to race when they arrive at a track. For Mazda Team Joest, bringing a Daytona Prototype car to the track for a test day involves a large team of engineers, drivers, and support staff. Costs can easily run into hundreds of thousands of dollars. So they send a smaller team of drivers and engineers to a professional simulator at Multimatic Motorsports in Toronto, Canada. Mazda Team Joest’s Olly Jarvis drove the Daytona road course faster than any other car in history. Advanced motorsports simulators allow teams to test different setups and changes to the car at a fraction of the price of an actual test day. Does all that simulator work pay off on race day? Numbers don’t lie, and in qualifying for this year’s Rolex event, Mazda Team Joest’s Olly Jarvis drove the No. 77 Mazda RT24-P Daytona Prototype around the Daytona road course faster than any other car in history. Jarvis not only captured the overall pole position, he broke the all-time course record set 26 years ago. “This is the result of all the hard work that’s gone in back at the workshop,” Jarvis said. The takeaway from this is that if you want to make a career out of racing, that steering wheel on your coffee table could well be your best path to success.